The Nortel BCM BRI-4 S/T - 4 Port BRI media bay module (NT7B76AAAH) provides 4 ports of BRI with a S/T Interface to your Nortel BCM platform. Supports four S/T interfaces (8 B-channels); Supports ETSI and National ISDN BRI; Utilizes 1/3 DS-30. The Nortel BCM BRI4 4-Port BRI Media Bay Module (NT7B76AAAH) provides 4 ports of BRI with a S/T Interface to your Nortel BCM platform. 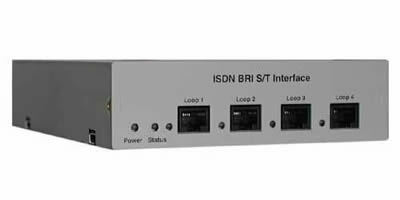 Supports four S/T interfaces (8 B-channels); Supports ETSI and National ISDN BRI; Utilizes 1/3 DS-30.